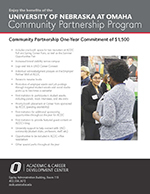 Our goal is to help connect UNO students and alumni to valuable employment opportunities, including internships, part-time and full-time employment. Looking to hire UNO students? Introducing our new online job and internship board - Handshake. We recommend that you create an account on Handshake and connect with UNO. Once your Handshake account is approved, you will be able to post available positions as well as request on-campus interview space. An easy to use, intuitive interface, with a clean, modern, and simple design - making it easy to navigate and use. UNO Career Connect, our previous job and internship board, was permanently shut down on June 30, 2018. Prior information, including job postings, resumes and applications are unable to be retrieved. Effective July 1, 2018, Handshake is the sole recruiting system used at UNO. Contact: Joe Hayes, Assistant Director of Employer Relations & Internships at jshayes@unomaha.edu or schedule a 30 minute call. Thank you to our 2018-2019 Employer & Community Partners! 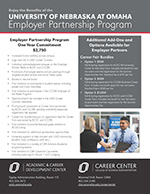 The UNO Academic & Career Development Center (ACDC) acknowledges our Employer and Community Partners for their commitment to assisting UNO students and alumni. Recently hired a Maverick? 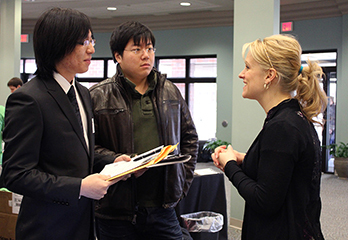 Report a Hire helps ACDC track where our UNO alumni are working and in what career fields.